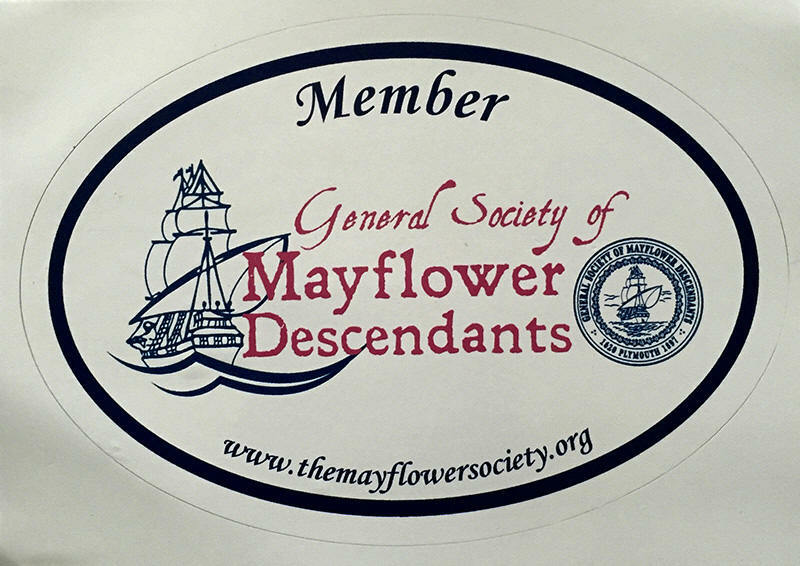 The Mayflower Society is named for the Ship Mayflower that brought the Pilgrims to America in 1620. The ship has become a cultural icon in the early history of the United States The ship was small and voyages across the Atlantic were very dangerous. This was made worse by sailing in the North Atlantic fall during the stormy season. Ships at that time were much smaller and less advanced than those shown in pirate movies about later times. The voyage is but one of many trials the Pilgrims faced in the early years. 1607--The ship was built in England about 1607 it was far from new in 1620 when the average ship lifespan was about 25 years. It was a cargo ship and is known to have made voyages to Scandinavia and Spain. The cargo was often wine and many believe that years of spilled wine protected the ship against woodworm and the Pilgrims from disease during the voyage. A main structural beam between decks split during a storm on the voyage and emergency repairs had to be made with a large house jack the Pilgrims had brought with them. Although the exact dimensions are not known, a good approximation can be made from her insurance papers. It was about 100 feet long and 25 feet wide at the widest. Most cargo ships of the time did not set low with only about 12 feet from the waterline to the keel. This led to the ship bobbing quite a bit at sea. After one Pilgrim fell overboard and was rescued, passengers were required to stay inside below deck. The second deck was called the gun deck and -*/ held several canons, powder room, cargo winches, their small boat and the 102 passengers. The 30 or so crewmen lived in various enclosed places on the main deck. A cross section view of the ship is here: http://mayflowerhistory.com/cross-section/. July 22, 1620 --The Pilgrim voyage started with those living in the Netherlands boarding the small ship Speedwell at Delfsheven near Leiden on July 22, 1620. It sailed to Southampton, England where they meet up with the ship Mayflower and more passengers. The Mayflower had sailed down from London and was loading more supplies at Southampton. The Speedwell had leaked on the short voyage to England and had to be repaired. Finally on August 5th the two ship sailed. August 12, 1620 -- The Speedwell continued to leak and both ships returned to Dartmouth Harbor. August 21, 1620 -- After repairs to the Speedwell they both departed England a second time on August 21st. After 300 miles at sea, the Speedwell was leaking yet again and the two ships returned to England. This time they docked at Plymouth, England; but this event is not connected to the naming of Plymouth of Plymouth Colony in America. 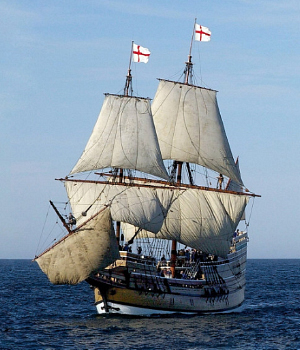 The decision was made to leave the Speedwell in England, transferring cargo and passengers to the Mayflower. 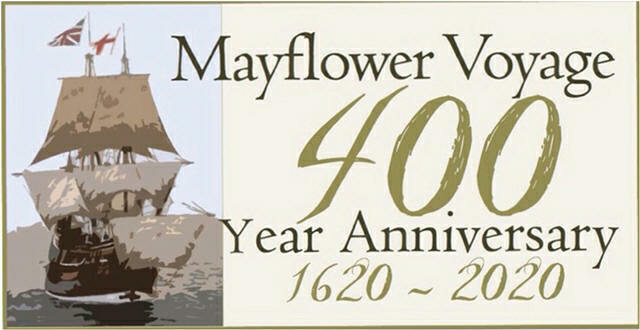 Several passengers decided to remain behind rather than face the overcrowded conditions aboard the Mayflower. Unlike Jamestown, the Pilgrims brought their wives and children including 3 very pregnant wives. September 6, 1620 -- Finally on September 6th, over six weeks after leaving the Netherlands, the Mayflower left England for the third time. November 9, 1620 -- After 66 more days at sea, many bad storms, and one new baby the shore of Cape Cod was sighted on November 9th. Their goal was to settle in the English claimed territory just south of the Dutch claimed territory of the Hudson River (now New York City). They were not far north of their goal and had only to sail south around Cape Cod and then west. However this was into the currents and headwinds with many uncharted sandbars. After failed attempts and with a weak structural beam, the decision was made to not try to go sail south again. November 11, 1620 -- They made a short trip back north and around the tip of Cape Cod into Provincetown Harbor where they anchored on November 11th. Here they signed the "Mayflower Compact" binding themselves together in government. In the very crowded Mayflower ship's hold with the Pilgrims was a 21 foot boat with oars and a small sail. After recuperating, they assembled and launched this to explore around the interior of Cape Cod Bay looking for a suitable place for a settlement. Exploring was hampered by snow and bad weather. The Pilgrims when not exploring, remained aboard the ship. December 25, 1620 -- After exploring the whole bay in a clockwise direction the decision was made to settle at Plymouth and the Mayflower was moved there on December 25th. The site had all the elements of the site they had been looking for. There were several good year round fresh water springs. A good stream with fish and ells and room to put their small boat in safety during storms. Eating ells was very popular. The land was cleared ready to plant and no one was living there. The Indians thought the area was haunted after all the previous tribe had died there. There was a tall hill near the shore that would give their cannon extra reach into the bay against possible pirates. The captain of the Mayflower had planned to return immediately to England. The Pilgrims had little trouble persuading him to stay the winter given the poor weather. The passengers lived on the ship while they constructed houses on shore. The ship finally left in the spring having lost several crewmembers to disease like the Pilgrims. The return voyage had good winds and took about half the time as the voyage to America. Records are scarce but the ship must have made cargo voyages around England after returning until captain and part-owner Jones death in 1622. It may not have sailed after his death and was valued at a very low price in May 1624. It presumably was sold for scrap. The name Mayflower was a very popular name for an English ship and so many were so named that more than one existed at times.